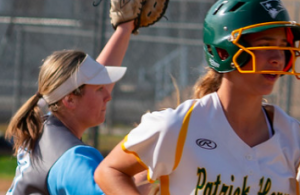 CHULA VISTA (4-2-2019) – The Patrick Henry High softball team proved resilient, backing their season-high No. 6 ranking by responding with two quick runs after powerful Eastlake 2-0 lead. However, the Titans are ranked at the top of the CIF San Diego Section for a season, answering back an inning later with another 2-run rally an inning to take an important 4-2 win in Falcon Fiesta tournament action Monday (Apr. 1). Despite the so-called “holiday” known for pranks, coaches from both clubs probably thought this should have been a possible Falcon Fiesta championship game match-up… until the joke was played on them when both ballclubs were placed in the same pool. Eastlake demonstrated its depth to snap the 2-2 tie with four basehits in the 5th inning. Areli Nava (bunt) and Sharlize Palacios (liner to left) both singled, then Patrick Henry recorded an important out when cleanup batter Hannah Slike rounded into a fielder’s choice for the second out. However, Taylor Tropp and pinch-hitter Olivia Manriquez Graf voth grounded RBI singles through the infield to re-claim the lead. 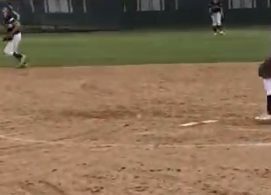 Meanwhile, Titans relief pitcher Rylee Alfaro tossed three innings of 2-hut ball to prevent a second comeback by Patrick Henry. The first Patriots comeback came in the 4th. Following consecutive one-out singles by designated player Edie Guthrie and first baseman Hailey “H” Jenks, catcher Dezianna “Dez” Patman bombed a 2-run triple to right field to score the game-tying runs. Patman finished batting 2-for-4. For Patrick Henry (7-2), leadoff hitter Kaiah Altmeyer batted 2-for-4 with a triple, while pitcher Olivia Gigante struck out four Titans. Eastlake (11-2), which assumed the top spot in the rankings after previous No. 1 Mater Dei Catholic suffered its initial setback last week, recorded seven singles, one from seven different players. GRANITE HILLS 10, STEELE CANYON 2: At Granite Hills, Catie Dobbs, who has not been her best in the pitching circle over the past week or so, gladly re-gained her stellar form on Monday (Apr. 1). 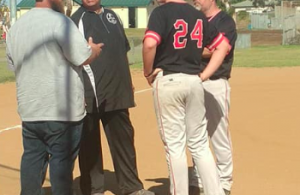 Not only did the senior pitch three innings of no-hit relief to save the ictory for Staci Chambers, Dobbs also knocked in three runs with a pair of home runs in a Granite Hills League triumph over the visiting Cougars. Dobbs went deep over consecutive innings. Following her lead shot in the 5th, she added a 2-run blast with two outs in the 6th, capping a 4-run rally to put Steele Canyon away. Dobbs also scored three times. The visiting Cougars stayed close for about half of the ballgame, even holding an early 1-0 lead in the 2nd inning. But once they scored, the Eagles’ rebuttal included runs in every inning over the balance of the game to slowly pull away to a comfortable victory to maintain the GHL lead. In the 2nd, Brooke Bertussi dropped a run-scoring base hit to right field to bring home third baseman Amaya Esparza (lead single) with the tying run. Two batters later, a line single by Baily Wallace brought home Dobbs, then the designated player, with the go-ahead run, with Bertussi also scoring on an error. Granite Hills (11-3 overall, 3-0 GHL)), ranked third in the CIFSDS, received two hits each from Dobbs, Esparza and catcher Haley Johnson, who had a double. Steele Canyon (6-8, 1-2 GHL) saw second baseman D.J. Dumeng register an RBI single with two outs to assume the early lead. HELIX 20, MOUNT MIGUEL 0: At Spring Valley, the Highlanders scored 11 times in the 1st, going on for their second-biggest victory this century as they started out with a bang in the Grossmont Valley League opener against the Matadors. The record is 23-0 against Montgomery on March 6, 2015. A margin of 18-0 occurred three other times, including a pair of wipeouts of San Dieguito Academy, coming last month and in 2008. Helix pitcher Zoe Kuhlken fired a 3-hit shutout, striking out 10 of 22 batters in the run-rule shortened game. Meanwhile, Kasey Castro, Erin Brown (two sac flies) and Avery Perez (four runs, three walks) each had 3 RBI for Helix (8-7 overall, 1-0 GVL). On the day, nine Highlander batters managed to reach base multiple times, including six who got on base at least three times each. Other major contributors included Jolene Giles (2-for-4, 3 R), and Lizette Bernardino (2-for-3, BB, 2 R). The Highlanders return home on Wednesday to battle the Monte Vista Monarchs. Monte Vista (7-4) collected only 2 hits in just four team trips to the plate, but scored thanks to ia series of wild pitches and passed balls. The hits were by leadoff batter Ionna Upham (4 RBI) and Meeah Matanane (double). VALLEY CENTER 8, CHRISTIAN 1: At Valley Center, the host Jaguars overcame an early 1-0 deficit with eight unanswered runs to capture Monday’s ( Apr.1) pool-play contest in the Jaguar Classic. The Patriots (2-7) took a 1-0 lead in the 2nd when Kate Manes drilled a one-out, solo home run to left field. “The pitcher was pitching a great game and just missed her spot,” Manes said. “The pitch was slightly inside and about belt high so I was able to get my hands around it in time. Valley Center (5-3) has now won three straight after the bottom of the batting order — Kofi Nelson and Ysenia Zepeta — each had two RBI, while Katelyn Dunckel and Mackenzie Olivo had solo homers.